Now that Platform licenses are available, I suspect that a lot of companies will “flip” Users from a full Enterprise license down to the Platform license – it just makes economic sense when you can do it. Be aware that when switching a User from a full Enterprise Edition (EE) License (Enterprise Sales Cloud or Enterprise Service Cloud seat) to a “Platform” license, any Custom Profile that was created using a full EE license cannot be used for a User using a Platform license. When you get your Platform licenses, under Setup > Admin Setup > Manage Users > Profiles you will see a new profile listed called “Standard Platform User.” You will need to clone this profile and make a new custom profile to provide the appropriate access for the Users that will be using the new Platform license. If you “flip” the User to the new license prior to making a new custom profile first, the User will automatically start using the “Standard Platform User” profile (very restricted access by the way) even though the User record still shows the old EE custom profile is assigned to that User. However, you will soon find out from your Users that’s not the case! 😉 Also, once you “flip” a User to the new Platform license there is no going back unless you have extra full EE licenses available. It’s a one way street. Notice in the screen shot below the “-3” licenses available – no going back! Lastly, notice that the Administrative and General Users permissions available on the Platform license profiles are a subset of what you see on a full Enterprise license. The permissions that went away are tied to the “CRM” functionality that is excluded from the Platform license – which makes sense. 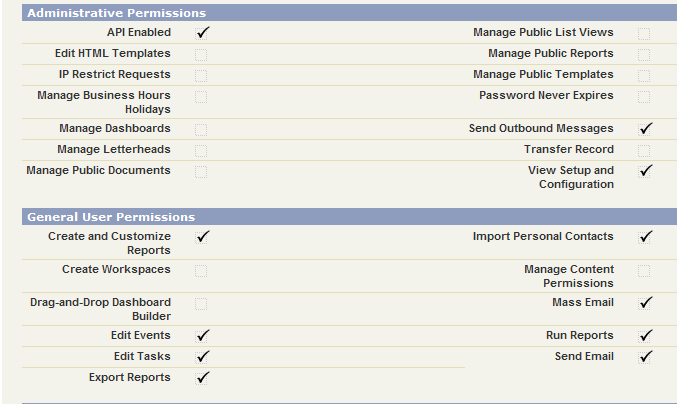 For example, permissions like “Manage Leads,” “Edit Case Comments,” “Edit Self-Service Users,” and “Import Solutions” are not available. Before purchasing a platform license, you better check your current custom profiles against the list of permissions in the screen shot below to make sure you’re not going to inadvertently limit what your Users can currently do in Salesforce. To solve the issue you will either need to change the “Running User” to a Platform user, or clone the Dashboard and make the “Running User” a Platform user. Weird – I agree, but that’s the fix!